Kelly is almost done with the body of the linen Summer Fjord. The pattern has a drop shoulder and no sleeves. She is thinking about picking up stitches and adding a sleeve. She has also been working on charity hats. One hat, Molly, has been finished. It's a simple textured stitch background with one large cable going up the hat. The second hat is her own pattern started flat and then joined in the round after doing a button tab brim. Both hats are made from leftovers in the stash. 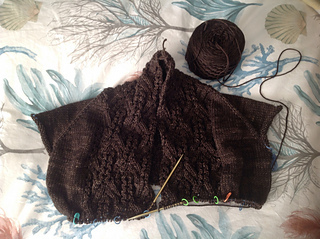 Marsha has made good progress on her Recoleta by Joji Locatelli and has starting the waist shaping. 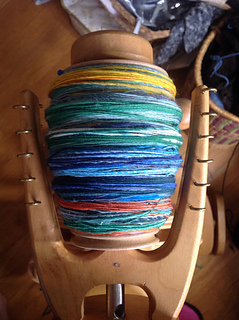 Marsha has been sidetracked knitting by her new obsession: combo spinning. 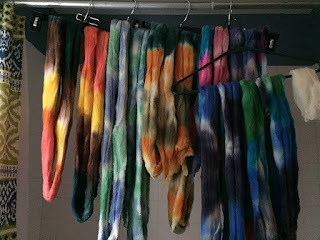 She did not have any dyed braids but had 24 ounces of roving in her stash that she dyed. 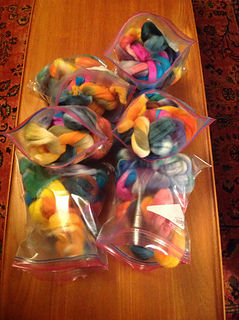 She then divided the roving equally by color and put in bags. Each bag is filling a bobbin with a bit of fiber left over. Very interesting project. So interesting, that not much is getting done around the house! The Two Ewes are planning a Winter Weave Along! It will be a 6 month learning adventure with weaving. It starts on October 1 and will go through March 31. It will include weaving instruction for beginners. Weaving information will start at the beginning so don't worry if you are new to the craft. Marsha is a beginner so she will be learning along, too. Handouts in pdf form will be delivered through the podcast feed to all the podcast subscribers. (If you aren't already subscribed there are links to subscribe on the sidebar of the shownotes. Or use your favorite podcatcher app.) The Ewes are also planning some short video tutorial. There will be a project discussion thread with weaving help and community. Any kind of loom will work, rigid heddle, floor, table, potholder loom, cardboard loom, loom made with wallboard and nail, etc. An FO thread will be available later in the year and there will be a giveaway at the end. There is also a Single Shot project along! Quick and satisfying like a single shot. This is for that small project around 200 yards or less. The perfect fun and done project for a palette cleanser. Knit or crochet something quick and satisfying. 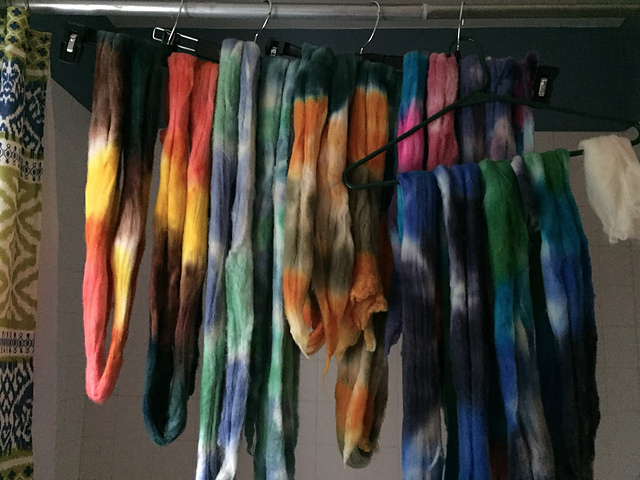 Prize thread in Ravelry group. starts now ends Nov 1. 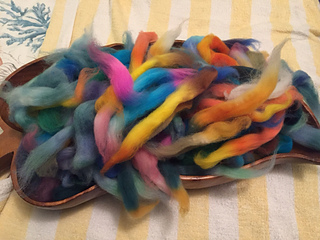 While Marsha dyed roving, Kelly dyed Shetland yarn for a project and put some extra in the shop. 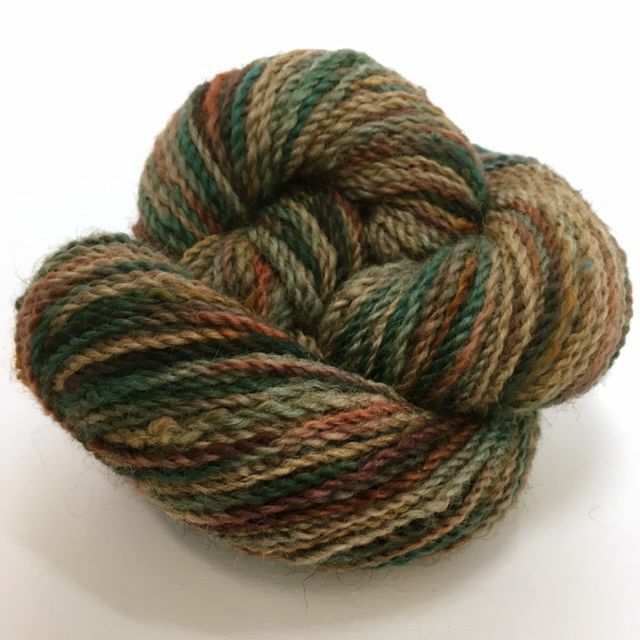 Check it out at twoewesfiberadventures.com! Here is a link the article about natural dyeing in Mexico from the 9/19/17 issue of The New York Times. Kelly will be going to Lambtown in Dixon, CA October 7-8. Marsha will be traveling to Scotland for the Edinburgh Yarn Festival in March 2018. She is looking forward to meeting any UK listeners who will be going, too. And of course, the Two Ewes will be at Stitches West in Santa Clara, CA in late February.